The AAVSO provides a wide range of services to the astronomical community. AAVSO International Database data are disseminated extensively to astronomers around the world, upon request, and are freely available from the AAVSO website. AAVSO data and services have been used, referenced, and acknowledged in hundreds of professional astronomical publications. A significant number of rare events have been observed with these satellites as a result of timely notification by the AAVSO. In recent years, the SWIFT satellite has been sending real-time notification to ground-based observers in the AAVSO High-Energy Network to alert them of Gamma-Ray Bursts (GRBs). Several GRB optical afterglows have been detected by AAVSO observers. In this way, AAVSO observers are contributing to cutting-edge, high-energy astrophysics. The AAVSO enables variable star observers to contribute vitally to variable star astronomy by accepting their observations, incorporating them into the AAVSO International Database, publishing them, and making them available to the professional astronomer. Incorporating an observer’s observations into the AAVSO archives means that future researchers will have access to those observations, so the observer is contributing to the science of the future as well as the present. 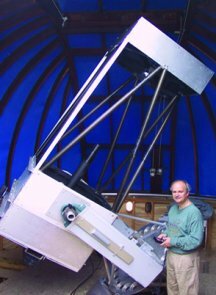 The AAVSO coordinates observing campaigns between professional and amateur astronomers, in which observations from amateur astronomers play an important role in correlating observations obtained with special instruments at earth-based observatories or aboard satellites. On request, the AAVSO will help set up an appropriate observing program for an individual, an astronomy club, an elementary school, a high school, college, and so forth. In this way observers, students, and faculty are able to make the best use of their resources to do valuable science. The AAVSO can also assist in teaching observing techniques and in suggesting stars to be included in a program through the AAVSO Mentor Program.